When ex-stripper Maureen Scoby asks private investigator Chauncey ‘Chance’ Means to find her husband, it isn’t just another routine missing-person case. Tom Scoby is a recovering drug addict on the brink of losing his badge and his marriage. He’s also Chance’s former-partner, and once took a bullet meant for him during a S.W.A.T. shootout. But when a heist from a police evidence facility goes awry, and a cop turns up dead, all signs point to missing Sergeant Tom Scoby as the perpetrator. Chance suddenly finds himself searching not only for his one-time partner, but for forty million in stolen narcotics as well. Chance soon discovers there are others searching for Scoby and the missing drugs; people willing to commit kidnapping and murder to find them. Soon Chance isn’t only trying to find his missing partner; he’s fighting to keep Maureen and her son safe from those who would stop at nothing to get their hands on the stolen dope. Complicating matters, is his growing attraction to Maureen. A distraction at a time when losing focus could mean losing his life. 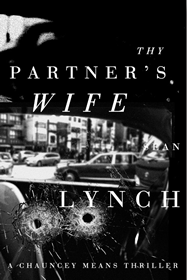 "Sean Lynch's THY PARTNER'S WIFE is a riveting thriller that bristles with hard-boiled authenticity. Chauncey 'Chance' Means is an engaging hero, crafty enough to investigate the mystery of his ex-partner's disappearance, and tough enough to handle the goons who turn up along the way to stop him. Fans of Michael Connelly are sure to devour THY PARTNER'S WIFE, and demand more from Sean Lynch."